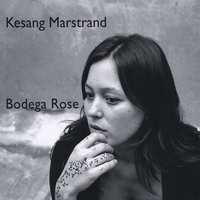 I liked Kesang Marstrand’s album the first time I heard it, but I was struggling with finding something to say. My first impression was that it was nice, just not grabbing me. But I’m glad I’ve kept it in my rotation for as long as I have because it grows on me more with each listen. She has a pretty voice. At times she does a sweet tilty thing that reminds me of Ani DiFranco. But actually, her voice is really quite unique and beautiful. Her stripped down version of Paul McCartney’s Say Say Say is cool. She really takes it down a notch in tempo which makes it almost haunting. I love Real Boy. It’s a very charming song that’s caught my attention several times while shuffling with other albums. It’s got piano which is probably at least part of the reason I like it so much. Thin Skin is another favorite of mine. She does some nice guitar picking in minor keys that is always appealing to me. Actually I’ll stop here before I end up naming every song. Nope, I must also say the title track, Bodega Rose is great. The songs are nicely melodic and interesting. The instrumentation is great, but minimal. That is, it’s mostly guitar, voice and a little percussion (an occasional harmonica and piano). The production is well done and helps richen the sound. This is a lovely mellow pop album, which will be in my personal rotation for some time.